These adorable, sparkly beaded cuffs are inspired by the bedroom door of Elsa from Disney’s Frozen film. Her sister Anna spends a lot of time outside that door, asking Elsa to come out and play with her around the castle. You may not have a castle of your own, but you can knit yourself some sparkly cuffs and head out to play! 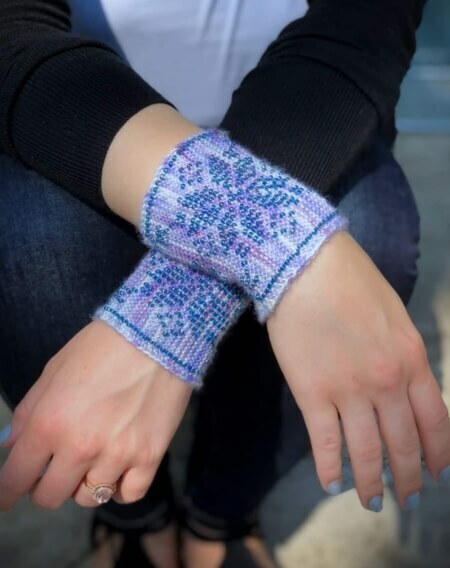 Originally designed for the 2018 Magical Fiber Fantasy retreat, these cuffs are now available to all in “Elsa’s Door” colorway, exclusively dyed by Emma’s Yarn. Cuffs can be started either with a provisional cast on then kitchenered at the end, or started with a long tail cast on, bound off, and whip-stitched together at the end. The Beaded Cuffs Kit comes with 1 skein of Emma’s Yarn Practically Perfect Sock (80% Superwash Merino / 20% Nylon, 400 yds) and 1 package of Miyuki 8/0 Glass Beads.